A knock-off on this classic baked brown rice, I wanted a Spanish-style rice to compliment dishes such as this one. Taking a note from several recipes I’ve seen lately, I used rotel tomatoes to help with the heat and flavor. We loved the result! Tender brown rice, lightly spiced with a bit of warmth from the tomatoes and seasonings, bakes to perfection in the oven and proves to be a simple, no-fuss side dish for many a Mexican- or Spanish-inspired meal. Although it was a lovely accompaniment to the chili verde, the most glorious way we ate this rice was as leftovers the next day, heated up and smothered in pepper jack cheese. The melty, spicy cheese offers the perfect creaminess to an already delicious rice dish. Yes, it also manages to make it laden with extra calories, but I’m telling you, it was seriously divine. Preheat oven to 350 degrees. Combine all ingredients in a 2-quart oven-safe baking dish. Stir well. Cover with foil and bake for 80 minutes until the liquid is absorbed and the rice is tender. Let sit for 10 minutes out of the oven. Salt and pepper to taste. Fluff with a fork and serve! This rice will be as spicy as the type of rotel tomatoes you buy. If you want it mild…well…buy mild rotel. If you like more heat, look for spicy rotel tomatoes. Would this take longer if I used more rice? I’m thinking 11-12 cups of rice (with the appropriate amounts of liquids). Need to make for a crowd. If it’s all in the same pan, yes it would take longer. Have you ever converted this to InstaPot? Would be great on a hot summer day. Love your recipes. Use them more than any other blog I follow. Always easy and dependable! This turned out great! Do you happen to know how I could adapt this recipe to my electric pressure cooker? If I’m going to double the recipe should I put it in a 9x13pan and increase the cooking time to what? I love your website! It should fit into a 9X13-inch pan…but I haven’t tried it so I can’t say for sure. I’d probably bake for the same amount of time (maybe add 5-10 min is all). Think this would work in the instant pot? If so, how long would you set it for? For white rice, probably just 4 minutes high pressure, but I’d reduce the liquid so it’s equal to about 1 1/4 cups liquid to every cup of rice. This is a fantastic recipe! I didn’t have Rotella so I just added a 16 oz jar of Salsa and adjusted the chicken broth accordingly. Everything else stayed the same. Turned out super yummy and so super duper easy! Thanks! Did you use the 10 oz size can of Rotel, or the larger can? Does it even matter? Yes, just the 10-ounce size. if i cut this recipe in half(only 2 people in my house!) and bake it in an 8×8, will i need to reduce the cooking time at all? Yes, I’d probably take 5-7 minutes off the baking time and check to see if it needs more. We make your baked brown rice regularly – about once a week (a double batch) and then use it as needed. We cute white rice out of our diets and cooking it on the stove top was getting really old and had varying results. LOVE the regular baked brown rice…. Had been making that over a year before finding this recipe recently. My mom has a recipe for Mexican (Spanish…just what we always called it) rice that I love but it wouldn’t work for brown rice no matter how I adjusted. Even found another recipe for Mexican Rice with brown rice but it didn’t compare. Just made this today for the first time and it’s SO similar and super easy (yay!!) and tasty. Thanks for the recipe! Also, I don’t use rotel so I took a can of diced tomatoes and sauteed it with half a diced pepper and half an onion. Upped the chili powder/cumin a bit. Great results. We used veggie broth for our vegetarian/vegan family. Thanks again! You know, I bet you could make a really good Italian rice with this too. Just use Italian stewed tomatoes and Italian spices. This recipe worked perfectly, which is a miracle b/c brown rice can be a stinker to get right! I quadrupled it as I was cooking for 30-40 ppl at my church and it made a TON. We had so much leftover. I think this recipe must serve way more than 6, I’d say more like 10-12. I think I could have doubled it and still had more than enough for my group. If I were to make it for just my family I would cut the original recipe in half, at least. I would also recommend adding a packet of taco seasoning and maybe some butter as well since brown rice has a tendency to taste a little… blah. This is my first time visiting this site and I will be back. Great blog! This is a great base recipie. I added a half of diced red onion, a splash or two of granulated onion, a couple shakes of paprika, about a cup of crushed tomato, a diced fresh tomato, and a half of hot fresh green Korean pepper. I put the tomato, red onion, chili powder, hot pepper and cumin in a food processor and blended until it was the consistency of semi thick salsa. Didn’t use the Rotel tomatoes. Turned out really well! Emily – I don’t know the exact ounces but it’s about the size of a soup can (maybe 9-10 ounces?). I just have a quick question! For the rotel tomatoes, how big of a can did you use (how many ounces)? Thanks! I made this tonight and I have to say that I was not impressed. I normally LOVE your recipes but I found this rice to be bland. However, I really like the idea of baking brown rice and I will say that the texture of the rice was perfect and I will definitely use this cooking method again. It also makes a ton of rice, you could easily cut this in half if you are serving it as a side dish for 4 to 6. This recipe is not a keeper for me but the method of cooking is and you have an amazing blog with fantastic recipes. Keep cooking- keep posting! I am so excited about this recipe. I LOVE LOVE LOVE Spanish rice but all my recipes call for white rice and I am trying to eat more brown rice. 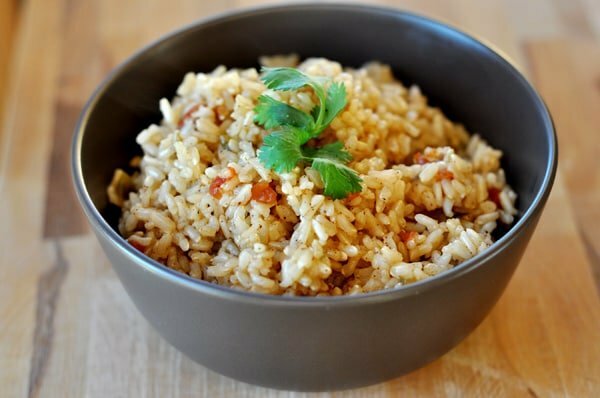 I use your baked brown rice recipe religiously and am thrilled that I came across this! Thank you! I was surprised how much I liked this and how well it turned out. There is literally no work involved in putting it together and it bakes effortlessly in the oven. I almost always use the rice cooker to make rice but this might get me to change my tune. I made this with the Best Ever Chicken Fajitas and they were a great combination. I have to admit, I was skeptical when I ran across this recipe. I was looking for a brown rice dish to go with fajitas. This was great! I have never baked rice before, but I will totally do it again! I did not drain my Rotel, but otherwise made as you wrote. Just wanted to give the recipe 2 thumbs up! Hi Mel – made this tonight with the Best Chicken Fajitas (which truly were! ), but I have a TON of rice left over. Any other suggestions other than the pepper jack smothering? Like a soup? I know it’s not soup weather, but I’d try it. Thanks! and thanks for giving my cooking an upgrade – LOVE your site and your recipes! You might also try Spicy V-8 juice instead of the Rotel. It gives the flavor without the heat. I made this last night and served it with black beans, fresh jalapenos & cilantro, and avocado on the side. It was great! Hi Crystal – for our family it easily serves 4-6 as a side dish. Hope you liked it! I can’t wait to make this. I love your baked brown rice. It is soooo delicious and nutritious. Thanks for healthy recipes and a great blog. A brown rice I adore is the organic short grain brown rice from Costco. Could this ever work in a rice cooker? BriAnn – yes, I think it probably would work in a rice cooker. I’ve never tried it but I don’t see why it wouldn’t. Let me know if you try it! Would you mind sharing the brand of brown rice you use? I’ve found that the flavor of brown rice is so strong, it doesn’t matter what spices I pair it with. Thanks! I was surprised that my very picky eaters ate this one up and told me they LOVED it! I really enjoyed it, too. Served it with creamy chicken enchiladas. YUM! Thanks for another winner. Brown rice is always challenging to get just right, so I love the idea of baking it to perfection. It was awesome! Alicia – oh, heavenly when picky eaters love what’s for dinner. So glad! I am always looking for new brown rice recipes, I can’t wait to try this! Perfect for a weeknight. Do you add the salt and pepper after cooking so that you don’t have to add as much? If so, probably a good idea for healthy-eating. Looks like another winner but I thought we agreed on chocolate & raisins for the next few posts? 🙂 Yup, raisins are yucky and chocolate doesn’t do anything for me. I LOVE your baked brown rice recipe; it’s the only one I use anymore. Thanks for this variation. We’ll be sure to try it soon! I’ve been searching for a recipe like this! thanks for sharing. Question, what type of brown rice works best? 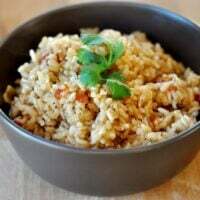 Lisa Z – I always just use long grain brown rice but I know other people swear by short grain. So, I think either should work out ok! Alton Brown bakes his brown rice too. I think it’s genius! Love your Spanish version! What could be easier? Looks delicious. Brilliant! We love the baked brown rice so I know this will be a hit at my house. I love brown rice and this recipe sounds delicious. I think I will try it today since I have all the ingredients. One of my favorite foods is rice, although it took me an entire month to perfect long-grain white rice (my poor kids). I attempted brown rice and just cannot adjust my taste buds to it. This recipe looks very good though (and easy). I am going to have to give this one a try.